To love, is to dare. It’s the “yes” to adventure. It’s the sun on your skin, and wind in your hair. A new romance. It’s a language of the heart that is best understood in metaphor. This Valentine’s Day, #GiveBrilliant with the Crystal Wishes Collection by Swarovski – modern tokens of love, which say “I love you”, through stylish symbols. 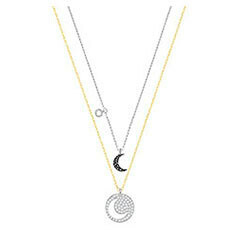 Embrace the brilliance of love with the Crystal Wishes Collection. The perfect for gift giving – take one half and give the other half to the one you love. The heart is a brilliant symbol of love, while a key opens the door to new adventures; give a gift infused with meaning this Valentine’s Day with these symbols of love. Available in five colours: Red, Blue, Pink, Black and Blue Teal, two interlocking pendants together for an on-trend look or keep one for yourself and give the other to a loved one as a symbolic gift. Both pieces feature a mix of metal platings. Let the moon symbolise your free spirit, or shield yourself and your loved ones from the forces of evil with the evil eye. Available in five colours: Red, Blue, Pink, Black and Blue Teal, the two interlocking pendants fit together for an on-trend look or keep one for yourself and give the other to a loved one as a symbolic gift. Both pieces feature a mix of metal platings. 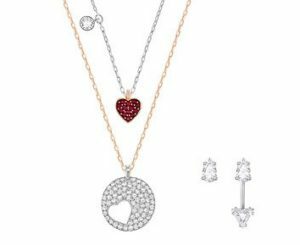 In addition to the pendant sets featured above, the Crystal Wishes Collection by Swarovski includes Heart, Key and Evil Eye bracelet sets and earrings. Also available, the complete Crystal Wishes Set. Offering countless different styling options, Swarovski Crystal Wishes Set includes two Crystal Wishes Heart Pendants plus a beautiful pair of Attract Pierced Earrings. The earrings come with one removable jacket, enabling you to rock an on-trend asymmetric look. The pendants are specially designed to slot together: the dangling red crystal heart on one pendant fits perfectly inside the heart-shaped cut-out in the other pendant. A perfect Valentine’s Day gift.